If your hobbies include the likes of fell running, tomb raiding or Tough Mudder then the average smartphone just isn't going to cut it. Fear not. Caterpillar, the company most known for diggers, tractors and the occasional workboot has been at MWC this week showing off its latest Android smartphone, the B15. The new phone is clad in silver anodised aliminium and shock absorbent rubber, letting it withstand drops of up to 1.8m on concrete and submersible in 1m of water for up to 30 minutes. It's also dust resistant and will operate in temperature from -20ºC to +50ºC. “The Cat B15 is one of the most exciting launches in the rugged mobile device sector, a handset that will with stand seriously tough conditions, whilst remaining distinctively designed, ” said Dave Floyd, the director of technology at Bullitt Mobile Ltd which acts as a global licensee for Cat phones. Of course, all that toughness on the outside shrouds a warm and fuzzy interior that boasts a dual-core 1GHz Cortex A9 processor running Android Jelly Bean. 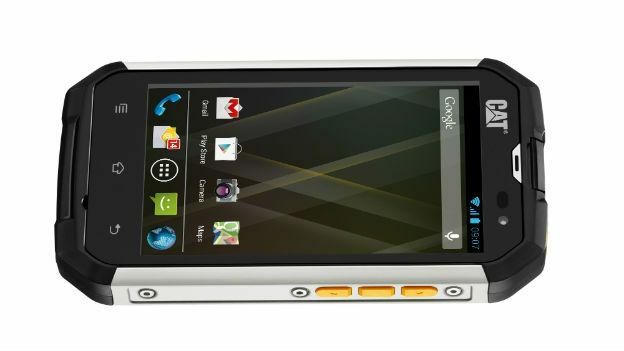 The 4-inch WVGA screen is made from Gorilla Glass and features wet finger tracking - but packs in a mere 800 x 480 pixels. So don't expect 1080p video breaks on your downhill mountain biking excursions. The B15 uses 512MB RAM and features 4GB of native storage, although this can be boosted with the addition of a microSD card. Cat has confirmed the B15 will be available from next month, and will arrive with a £299 price tag.